This condo sits in the perfect location at an affordable rate. The nearest ski lift is just a parking lot away (approx. 200 yards). Old town is also within walking distance, however if you prefer a free shuttle bus comes approximately every half hour for a quick ride downtown. This shuttle is also easy access to outlet malls, Deer Valley Ski Resort, and The Canyons Ski Resort. In the condo there are two bedrooms. The master bedroom includes a queen size bed, TV. with cable, and a private bathroom with a full bath. The second bedroom includes two twin size beds, and a TV. with cable. The living room also has a TV. with cable along with a large sofa with can be pulled out into a bed. The condo also includes a small dining area along with a kitchen. Great location, across the street from the ski slopes, just walk through the large parking lot and head a few steps up the hill. Communication with owner was excellent. Place is cozy and warm. Bus stop for free bus right outside the gate. Perfect size for 2 adults and 2 children but you could put another kid/guest on the foldout couch. There is some noise from the street at night because the bedroom windows face Empire Ave, and you can hear the gate clang shut when people in the complex come and go. Otherwise great value and convenience for the price. Would rent it again! Perfect spot for our trip. Cozy but comfortable. I'd say it's a perfect space for 4 people. 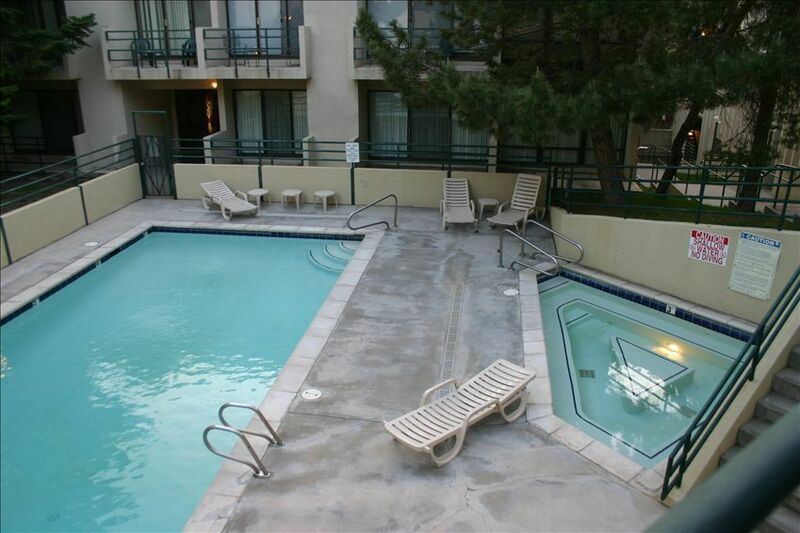 It is within easy walking distance to Park City base, and you can't beat the bus station right outside your door. You can catch the bus right there to Main St., Canyons base, and Deer Valley. The buses were frequent. The hot tub was large enough for two parties to use at the same time. We cooked in two nights, and the kitchen was fine. Only caveat I'd add is that the bedroom windows are close to the street/bus stop. If you are a light sleeper, you may hear some vehicle noise. Overall a place I'd gladly return to. We stayed here for three weeks during the ski season. This is a great location for accessing the mountain (bus stop right outside the complex with frequent buses). We didn’t have a car and walked or used buses to get to Main Street, supermarkets etc. Didn’t miss a car at all. The apartment was very comfortable for four adults. There was enough basic kitchen equipment for us to prepare and cook our meals. We made good use of the spa in the complex. Mark quickly responded to all queries and was very easy to communicate with. Ones a year we are going for our skiing vacation. This year we decided to spend our holiday at Park City. We have chosen that apartment based on the location and price. That was a good decision. We did not regret it. The unit was exactly as it was advertised. Clean, spacious, warm. Kitchen has all things you need to prepare meals for you and your team. Living rooms is big enough for everybody to relax by a gas fireplace after skiing. And most important is a location. You almost can’t beat that. 5 minute walk thru parking lot and you are by the first lift. Bus stop is right in front of your door in case you want to go to supermarkets or to Main Street. Or you can walk there in less than 15 minutes. Highly recommended this apartment to anybody who is coming to Park City to ski or do any outdoor activities. We had great time here. The apartment is perfect for 4-6 people, with two bedrooms and two bathrooms. It is quite updated and very well maintained. It is very, very close to the slopes. We walk everyday and it takes like 3 min. Great apartment!!! This beautiful condo is located walking distance from the lift. After skiing you can enjoy this quaint cabin style condo while enjoying the amazing fire place in the cozy living room or relax in the full-size heated pool or hot tub. I will never stay in another condo again. Rate was also out of this world too!! 5 stars!